Here is another card I created with the April release of Pears & Raspberries Color Plus from Doodle Pantry. I absolutely love this set. For this card, I took two of the pre-colored pears and put them together. I then removed one of the leaves. Everything was pre-colored for me, and the background paper is from this set too. I layered that with lime green and then a white card stock base. I used the lacy ovals from Spellbinders and then free-hand cut the scalloped background behind that. The sentiment is also from this set and that was just cut into a rectangle and sponged lime green ink around the edges.. I added acrylic green flowers for my bling. Love how this turned out! Your lime green paper and the die you used for the pears are the perfect fit for your pears! Love this! Pear-fect card! Love how you rearranged things. Beautiful colors and layout! Oh Dang...I was gonna say pear-fect, but Donna beat me to it. Shucks. But, I can say this is "mouth-watering"! Everything about it screams: SUMMER! Oh, I am so ready for summer, had all the winter I can stand! LOL Susan, you have done it again (hey, wasn't that a song? Oh, nevermind. LOL) All the lucious colors, and how clever to "pear" them together like you did. LOL I just love the whole lime green of it all...that's what makes my mouth water! Yum! Yummy! I love pears. This card is certainly beautiful and very nicely laid out. Great coloring. Gorgeous!! Love the colors...dare I say 'pear-fect' choice?? ;) Great idea to use the lacy oval on a scallop oval....I could never hand cut an oval that perfect. WooHoo...she's back! Missed you Susan! This Pear card is lovely! So glad you are feeling better! 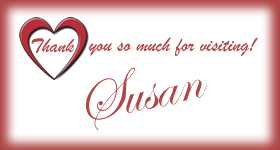 Gorgeous card, Susan! Terrific job on blending the two images. Don't you just love Laurie's papers? I use them for all kinds of designs, not just with the digis in the sets. Love it Susan, very simple but elegant! Love the vivid colors. Clean, crisp design -- my favorite!